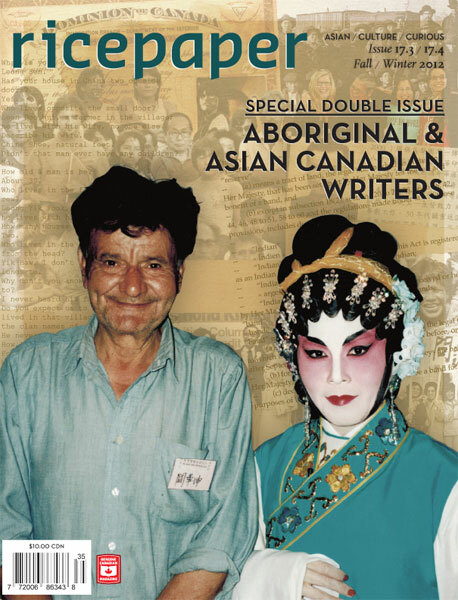 Come and celebrate our new Ricepaper Magazine issue at the launch party at Historic Joy Kogawa House on April 6th… featuring Aboriginal and Asian Canadian writers…. On April 6, 2013 from 2:00 pm – 6:00 pm, the Historic Joy Kogawa House is hosting our Special Double Issue Launch Party. The event will coincide with the opening reception for the Text/Textiles exhibit, featuring collections from international textile artists. The opening reception will begin at 12:00 pm and Cherry Blossom: A Textile Translation Retrospective exhibit will be available for viewing until Sunday, April 21. Saturday, April 6 will introduce featured writers published in the new issue of Ricepaper magazine: Carrie Calvo, Michelle Sylliboy, Russell Wallace, Wanda John Kehewin, Elaine Woo and Jonina Kirton. The reading will be from 2:00 pm – 4:00 pm. Saturday, April 13 from 2:00 pm – 4:00 pm, Joy Kogawa House will host a family reading with Jacqueline Pearce. The author of The Reunion will enthrall the audience with her story of a friendship between a Sikh girl and a Japanese Canadian during World War II. Saturday, April 20 will showcase a group of poets from The Planet Earth Anthology, published by Leaf Press. The reading will be from 2:00 pm – 4:00 pm. 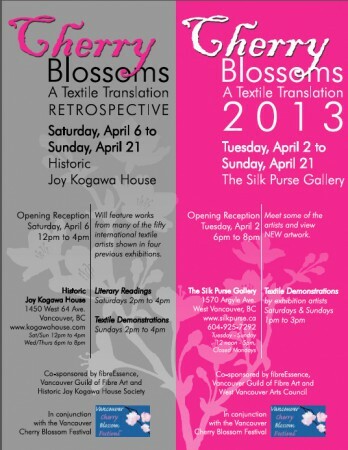 The Silk Purse Gallery in West Vancouver is also exhibiting new artwork in Cherry Blossom: A Textile Translation. As an expression of the changing season from winter to spring, artists from Canada, USA and Japan come together to display the range of inspiring art on silks, sculptures, books and clothing. Opening reception is on Tuesday, April 2 from 6:00 pm – 8:00 pm, and the exhibit is open until April 21. This entry was posted in Canadian Identity, Canadian Identity & Heritage, Cultural Fusion, Hapa culture, Joy Kogawa & Kogawa House, Ricepaper Magazine on April 4, 2013 by admin.